Almost 80% of the care of people with diabetes takes place in the primary care setting. The chronic care model (CCM) is an organizational approach as well as a quality improvement (QI) strategy in caring for people with chronic diseases, the elements of which are evidence based. These elements facilitate planning and coordination among providers while helping patients play an informed role in managing their own care. The CCM model aims to transform the care of patients with chronic illnesses from acute and reactive to proactive, planned and population based. This model has been adopted by many countries and several Canadian provinces. Diabetes care should be proactive, incorporate elements of the CCM, and be organized around the person living with diabetes who is supported in self-management by an interprofessional team with specific training in diabetes [Grade C, Level 3]. The degree to which care delivered in a primary care setting conforms to the CCM is an important predictor of the 10-year risk of coronary heart disease (CHD) in patients with type 2 diabetes. Initially, only process outcomes, such as behaviours of patients and caregivers, are improved with the CCM. However, with longer-term use of the model in clinical practice, improvements in clinical outcomes are noted, such as reductions in glycated hemoglobin (A1C) and low-density lipoprotein cholesterol (LDL-C) levels. One large-scale analysis of a nationwide disease management program using the CCM and based in primary care reduced overall mortality as well as drug and hospital costs. Diabetes care management by an interprofessional team with specific training in diabetes and supported by specialist input should be integrated within diabetes care delivery models in the primary care [Grade A, Level 1A] and specialist care [Grade D, Consensus] settings. In adults with type 2 diabetes, the CCM has been associated with improvements in A1C, blood pressure (BP), lipids and care processes compared to care that is delivered by a specialist or primary care physician alone. The role of the diabetes case manager should be enhanced, in cooperation with the collaborating physician [Grade A, Level 1A] , including interventions led by a nurse [Grade A, Level 1A], pharmacist [Grade B, Level 2] or dietitian [Grade B, Level 2], to improve coordination of care and facilitate timely diabetes m anagement changes. Recent meta-analyses involving people with both type 1 and type 2 diabetes showed a significant 0.76% drop in A1C as well as improved adherence and quality of life (QOL) and reductions in adverse drug reactions and LDL-C with collaborative pharmacist intervention. A Canadian randomized trial that added a pharmacist to primary care teams showed a significant reduction in BP for people with type 2 diabetes. Practices with nurse practitioners were found to have better diabetes process outcomes than those with physicians alone or those employing only physician assistants. A reduction in preventable, diabetes-related emergency room visits has been noted when the team includes a specifically trained nurse who follows detailed treatment algorithms for diabetes care. Small-group or individualized nutrition counselling by a registered dietitian with expertise in diabetes management is another important element of team-based care. A variety of individual and community health care support systems, particularly psychological support, can also improve glycemic control. The meta-analysis found that a high frequency of patient contact and the ability of the disease manager to start or modify treatment with or without prior approval from the primary care physician had the greatest impact on A1C lowering. Other disease management strategies associated with positive outcomes are the delegation of prescription authority and the monitoring of complications using decision support tools. Self-management support, including self-management education, is the cornerstone of diabetes care in the CCM. Self-management is a systematic intervention that involves active patient participation in self-monitoring (physiological processes) and/or decision making (managing). Self-management enables the person with diabetes to take an active role in managing his or her own care through problem solving and goal setting, which can be facilitated through the use of motivational interviewing techniques. Self-management support, often through disease or case management, with strategies such as patient reminders, helps the individual in self-management. In a systematic review, evidence-based guideline interventions, particularly those that used interactive computer technology to provide recommendations and immediate feedback of personally tailored information, were the most effective in improving patient outcomes. Incorporation of evidence-based treatment algorithms has been shown in several studies to be an integral part of diabetes case management. Even the use of simple decision support tools, such as clinical flow sheets, have been associated with improved adherence to clinical practice guidelines for diabetes. Clinical information systems (CIS) that allow for a population-based approach to diabetes assessment and management, such as electronic medical records (EMR) or electronic patient registries, have been shown to have a positive impact on evidence-based diabetes care. Practice-level clinical registries give an overview of an entire practice, which may assist in the delivery, monitoring and timely management of patient care. Provincial- and national-level registries are essential for benchmarking, tracking diabetes trends, determining the effect of QI programs, and for resource planning. Audits and feedback generally lead to small but potentially important improvements in professional practice and seem to depend on baseline performance and how the feedback is provided. Facilitated relay of information to clinicians may include electronic or web-based methods through which patients provide self-care data and the clinician reviews have been shown to improve care. Physician and patient reminders also have shown benefit. Environmental factors, such as food security, the ability to lead an active lifestyle, as well as access to care and social supports, impact diabetes outcomes. Community partnerships should be considered as a means of obtaining better care for patients with diabetes. For example, peer- or lay leader-led self-management groups have been shown to be beneficial in persons with type 2 diabetes. Support for diabetes care from the broader level of the health care system (e.g., national, provincial) is essential. A number of provinces and/or health regions have adopted an expanded CCM that includes health promotion and disease prevention. Many have also developed diabetes strategies, diabetes service frameworks and support diabetes collaboratives. Some provinces have added incentive billing codes for patients with diabetes so that providers can be compensated for the use of flow sheets, time spent collaborating with the patient for disease planning, etc. Pay-for-performance programs, which encourage the achievement of goals through reimbursement, are more commonly used outside of Canada. To date, these programs have had mixed results. Although not a specific element of the CCM, telehealth technologies may help facilitate the model through conferencing or education of team members; telemonitoring of health data, such as glucose readings or BP; disease management via telephone or internet; or teleconsultation with specialists. Telehealth also appears to be effective for diabetes self-management education and has been associated with improvements in metabolic control and reductions in CV risk. Telehealth technologies may be used as part of a disease management program to improve self-management in underserviced communities [Grade B, Level 2], or to facilitate consultation with specialized teams as part of a shared-care model [Grade A, Level 1A]. Chronic care model (CCM) The CCM is an organizational approach to caring for people with chronic diseases as well as a quality improvement strategy, the elements of which are evidence based. These elements facilitate planning and coordination among providers while helping patients play an informed role in managing their own care. 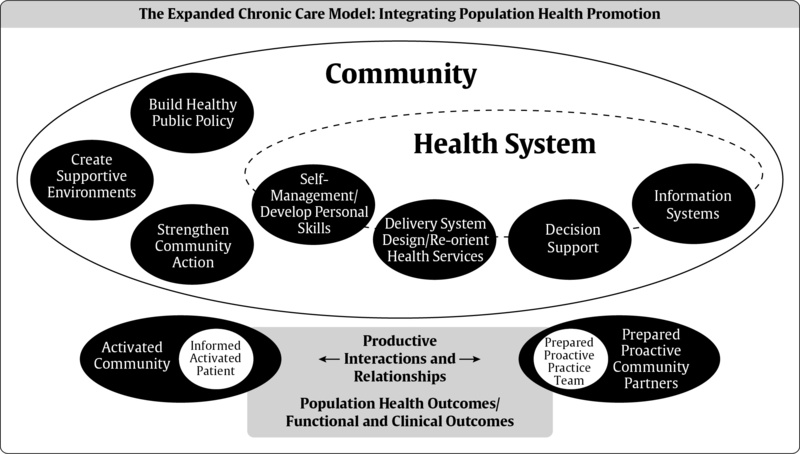 This model has evolved from the original Wagner CCM (1999) to the expanded care model. Primary Care First contact and ongoing healthcare: family physicians, general practitioners and nurse practitioners. Shared Care Joint participation of primary care physicians and specialty care physicians in the planned delivery of care, informed by an enhanced information exchange over and above routine discharge and referral notices. Can also refer to the sharing of responsibility for care between the patient and provider or team. Audit and feedback Summary of provider or group performance on clinical or process indicators delivered to clinicians to increase awareness of performance. Clinical information systems The part of an information system that helps organize patient and population data to facilitate efficient and effective care. May provide timely reminders for providers and patients, identify relevant subpopulations for proactive care, facilitate individual patient care planning, and share information with patients and providers to coordinate care or monitor performance of practice team and care system. Clinician reminders Paper-based or electronic system to prompt healthcare professionals to recall patient-specific information (e.g. A1C) or do a specific task (e.g. foot exam). Collaboration A collaborative intervention is a method used to help healthcare organizations apply continuous quality improvement techniques and affect organizational change. Continuous quality improvement Techniques for examining and measuring clinical processes, designing interventions, testing their impacts and then assessing the need for further improvement. Decision support Integration of evidence-based guidelines into the flow of clinical practice. Disease (case) management A structured, multifaceted intervention that supports the practitioner/patient relationship and plan of care; emphasizes prevention of exacerbations and complications utilizing evidence-based practice guidelines and patient empowerment strategies May include education, coaching, treatment adjustment, monitoring and care coordination, often by a nurse, pharmacist or dietitian. Facilitated relay of information to clinician Clinical information collected from patients and sent to clinicians, other than the existing medical record (e.g. pharmacist sending SMBG results). Patient registry A list of patients sharing a common characteristic, such as a diabetes registry May be paper based but increasingly is electronic, ranging from a simple spreadsheet to one embedded in an electronic health record. Patient reminders Any effort to remind patients about upcoming appointments or aspects of self-care (e.g. glucose monitoring). Self-management education (SME) A systematic intervention that involves active patient participation in self-monitoring (physiological processes) and/or decision making (managing) (see Chapter 7: Self-Management Education). Self-management support In addition to SME strategies that enhance patients’ ability to manage their condition, including internal and community resources, such as disease management with patient reminders, monitoring and linage to self-management support/interest groups. - Adding a team member or shared care, such as a physician, nurse specialist or pharmacist. - Using an interdisciplinary team in primary routine management. - Expansion of professional role (e.g. nurse or pharmacist has a more active role in monitoring or adjusting medications). Lay leader Trained and accredited non-healthcare professional delivering a program that adopts a philosophy of self-management rather than the medical model. Telehealth Delivery of health-related services and information via telecommunications technology. Recognize: Consider diabetes risk factors for all of your patients and screen appropriately for diabetes. Register: Develop a registry for all of your patients with diabetes. Resource: Support self-management through the use of interprofessional teams which could include the primary care provider, diabetes educator, dietitian, nurse, pharmacist and other specialists. Relay: Facilitate information sharing between the person with diabetes and the team for coordinated care and timely management changes. Recall: Develop a system to remind your patients and caregivers of timely review and reassessment. If you would like more details on this topic, including references, please visit the Canadian Diabetes Association Clinical Practice Guidelines: Chapter 6. Please see Appendix 2 for a sample diabetes patient care flow sheet for adults.